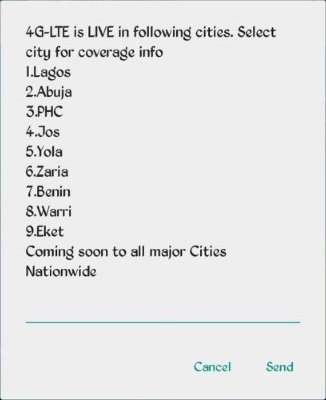 LTE Network is now available in your neighborhood as MTN, nTel and Glo have fully deployed their 4G LTE network while Etisalat has just been confirmed to have launched the service in Nigeria. While it might be a little bit late when compared with other telecom providers globally, it is still a very welcome development. 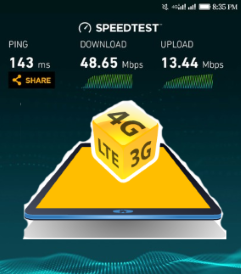 Almost all devices launched recently are fully 4G LTE enabled and the speed is blazing. 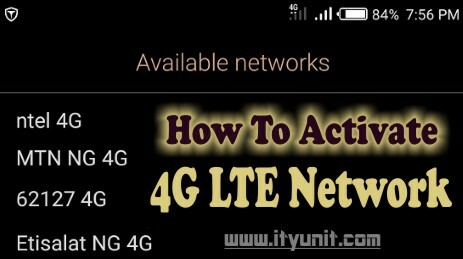 This post shows how to confirm 4G LTE service in your area and how to activate it on your phone as well as how you can subscribe to any of the available data plans for each of the network. MTN has the widest 4G LTE coverage available for all states in Nigeria. To use MTN 4G data plan, you must be using a compatible phone and must have swapped your sim for MTN 4G sim card from any MTN office nearest to you before you can be part of MTN 4G evolution. 1. 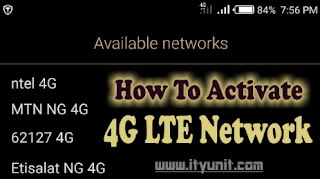 Confirm that your device is 4G LTE enabled. Alternatively, use the USSD code, text 4G to 131 on MTN and you will receive a text to know if your device is compatible or it. 2. Go to the any MTN Store or Partner and either swap your current MTN sim or just buy a new 4G LTE SIM and registered it. 3. When you have the 4G enabled sim (either by swap or purchase), dial *444# and subscribe to any of the MTN 4G available plans. If you have confirmed your smartphone that it's compatible with MTN 4G network and you have swapped to MTN 4G compatible sim. Dial *444# to check and choose MTN 4G data plan suitable for you. 1. Confirm that your device is 4G LTE enabled. Either check the specs written on the body of the device purchase box or go to settings and search for available networks. Alternatively, use the USSD code, text 4G to 400 on Glo and you will receive a text to know if your device is compatible or it. 2. Go to the any Glo World Office and either swap your current Glo sim for a 4G LTE sim or just buy a new 4G LTE SIM and registered it. 3. When you have the 4G enabled sim (either by swap or purchase), dial *777# and subscribe to any of the 4G available plans. Recharge your Glo Sim. Dial *777#, then choose Data Services » Buy Data » Monthly Plans. Follow the on-screen instructions to activate the plan. Please note that your current 3G Modem will not support the The Glo 4G LTE sim. You also need to buy a new Glo 4G router or any Universal MiFi available to you. Alternatively, you can share your 4G connection via hotspot from your 4G enabled smartphone to your PC.